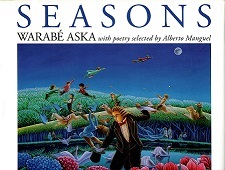 Warabé Aska is the pen name of Takeshi Masuda. Born in Kagawa, Japan during the second world war, Aska worked initially in commercial art and graphic design before turning his attention to painting. This led to a career as a book illustrator in Japan, an art form that he continued following his move to Canada in 1979. In Canada, Aska is best known as an illustrator of books for children and also as a writer for children. Several works feature both his text and illustrations while others including Aska’s Animals, Aska’s Birds and Aska’s Sea Creatures, feature Aska’s paintings but contain the text of other writers. With poetry selected by Alberto Manguel. In a riot of color, Aska celebrates the whirling gusts of Spring and the informal ceremony of a Summer wedding, the billowing sheaves of an Autumn harvest and the serenity of a skater in Winter. Each painting evokes the joy of the moment and the wonderment of childhood, when all things seem newly created, and anything is possible. Alberto Manguel, the renowned editor and translator, has selected enchanting poems from around the world to complement each painting. As a very hot day in a Spanish village by the sea draws to a close, the children have grown bored and quarrelsome. They turn to their uncle to amuse them. He, too, is ready for a break from his work and tells them a story they love to hear. Once he had grand dreams of seeing the world, but now he is known as “Tapicero Tap Tap,” after the sounds that come from his humble furniture workshop. The war robbed him of his dreams of travel and he stayed in his small Spanish village making fine sofas and chairs. 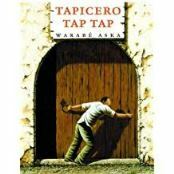 But Tapicero Tap Tap is far from bitter: he has found and shared the treasures of a productive life lived among family and good friends. And besides, it’s never too late to travel. Who Goes to the Park? A seasonal approach to Toronto’s High Park. 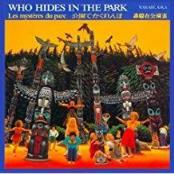 Who Hides in the Park? Text in English, French and Japanese. Features highlights of Vancouver’s Stanley Park. Jones, Raymond E., and Jon C. Stott. Canadian Children’s Books: A Critical Guide to Authors and Illustrators. Don Mills, Ont. : Oxford University Press, 2000. The Storymakers: Illustrating Children’s Books: 72 Artists and Illustrators Talk About Their Work. Markham, Ont. : Pembroke Publishers, 1999.